The University of California, San Francisco (UCSF) has tremendous intellectual, scientific, material and human resources to contribute to improvement in the health and well-being of the public. Local communities also represent a wealth of knowledge and resources. San Francisco is well known for its thriving and multi-faceted public, nonprofit and private sectors that contribute to the City's social, economic and community well-being. UCSF's Center for Community Engagement endeavors to harness University resources in collaboration with those in San Francisco communities to bring new meaning to the definition of a public research university — one that truly serves the vibrant communities of San Francisco. UCSF has a unique opportunity to promote health equity and improve well-being by collaborating with local communities in a deliberate and mutually respectful way. UCSF has historically had a strong, but disparate and uncoordinated presence in San Francisco communities. 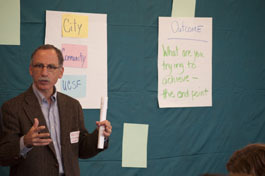 The Center for Community Engagement offers the potential for more coordinated and productive partnerships between community–based organizations, local government, private sector, philanthropy and UCSF.